Today I woke up early to check out the "Hawaii Auction Block". Met up with Brooks Takenaka (right) and his crew at the United Fishing Agency on pier 38. If you haven't been here before you gotta check it out. Nobu-san, Guy Tamashiro, and all the big seafood stores buyers come here for the fresh catch of the day. Ahi was the call and there were over 25,000 pounds of fish today from five boats. I was in pursuit of Opah or moon fish for today. I've never seen these diving before so I thought I get some for the party. Also picked up some nice "Big Eye" tuna which looked so ono. I wish I had a bowl of rice, wasabi, shoyu, and miso soup. This fish has 30 percent yield so if you get a chance to eat it, chew slowly and enjoy! Thanks to Brooks, Nelson, and the boys for helping me get fish. Their website is www.hawaii-seafood.org. And I didn't even have to get into my wetsuit. Woke up 5:00 am this morning to check the weather and it was still blowing southwest winds so we loaded up the Red Sea Boat and went to get fish for the party. Joining todays adventure was Wayde Hayashi, Kirby Fukunaga, and Hayato Maki. 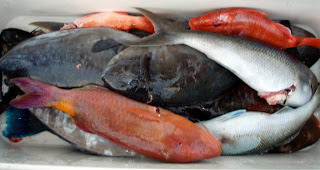 We were diving a little deeper and got an assortment of poke fish and some for the steamer as well. These are all top grade fish which I hope many will enjoy eating. Of course Wayde (former US National Champion) got the prize catch. 4-5 lb. Moana Kali is hard to come by for any diver. 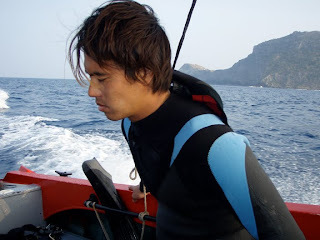 Hayato Maki is a professional surfer in Japan and learning to dive so we put him on a ulua house and he had a chance at a big 70+ lb ulua but unfortunately today was not his trophy day. Coming home I could tell he will have Ulua nightmares for the next week. Could of, would of, should of... but that's diving and everyone one of else have gone through that experience in some way. Forecast was for southwest winds today so we decided to load up the Red Sea boat and go east. 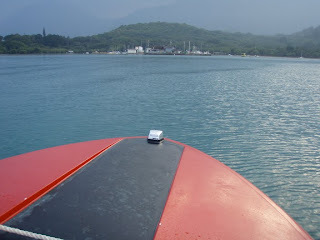 There was a little morning sickness that surprised all of us as we approached the head buoy. A beautiful sunrise peaked over the horizon and we headed for the blue water which ended up being green with all the north swell wrapping around. My friend Kris decided to take out a "tohe" white eel. 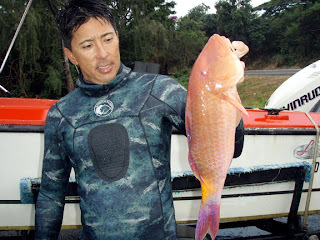 This suppose to be good eating, but even better if used for bait for catching Ulua. I think he chose the later use. Tako-man Travis Masutani had the eye today and got three 5-five pound takos. I still need to learn the technique of hunting tako. It's been a slow season for tako but if you know where to look you can find them. Tomorrow's another day so gotta get some rest so we can go dive again. This weekend was beautiful! We decided to revisit the "friendly island" of Molokai. If you ever want to experience how Hawaii was 100 years ago, this is the place to go. The people are generous and the aloha spirit is alive and well. Maui is in the background and on a clear day like today you could even see Haleakala. We are so luck we live in Hawaii. Of course we had to stop by and grab some of the famous molokai bread to bring home for the family. I hear tomorrow is a holiday (Martin Luther King) so everyone have a nice day off. Like Martin Luther King said he had a dream! So you to should be dreaming big for 2010! Today the water was flat like a lake. With west winds forecasted for the day, east was the side to go and east we went. One of my favorite landmarks is Chinaman's hat. It looks like a hersheys kiss but a sweet little island to hang out. I thought this was a cool picture. Two of my dive partners, Team "Sporasub" Erick Itoman and Keith Yamane was able to make it out and it was a relaxing kind of day. Caught a few fish and tako for the "big" party. I even shot my biggest menpachi to date weighing in 1 lb. I dove into this cave, saw it hovering in the middle and I thought it was a alai'i. It started swimming toward me, so I pulled by trigger and was pleasantly surprised. I heard this is considered good size for this specie so I'm having nitsuke style tomorrow night with some somen on the side. North winds forecasted for tomorrow so go south for offshore conditions. Today winds were howling southwest winds so we decided to board Kirby's boat and head northeast. Couldn't believe how empty the pier was today but it was a great day. Water was so clean and as soon as jumped in we both saw some huge kumu's that got away. Kirby called me over to see a school of Omilu (Blue-fin trevally) that was in a hole. He went down and bam! Later another flew past me and went into another hole. I went down hoping it was there but it wasn't. I waited, waited, then from the back of the hole it swam for me giving me a good head shot. It wasn't even 1 hour into our dive and we were ready to call it day. They weighed in around 15 pounds. Kirby had to take a few pics for his blog showing him hard at work. We ate lunch got a few tako and headed home. Thanks Kirby for a fun day of diving!